Last week we covered the basics of multimeters – what they can measure, how they show that information, and aspects to look out for when selecting a new multimeter. 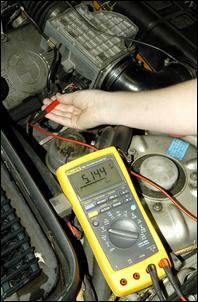 This week we’ll get into the nitty gritty of using a multimeter to make on-car measurements. 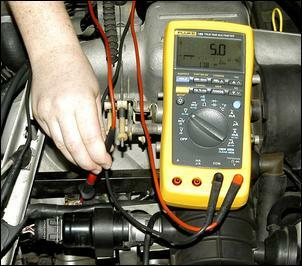 Multimeter measurements on car wiring fall into two categories – measurements done with the system all together and working, and measurements taken with something unplugged. Measurements with the system up and running are normally made by either ‘back-probing’ plugs or by piercing the insulation of the wire. If you’re back-probing at the ECU itself, you may need to remove a comb-like piece of plastic that holds the pins firmly in place. Don’t forget to put it back afterwards. If the multimeter probe is too large in diameter to effectively back-probe, it can be extended by wrapping a stiff piece of thin copper wire around it. Insulation-piercing probes are available which allow conductors to be accessed directly through their insulation cover. 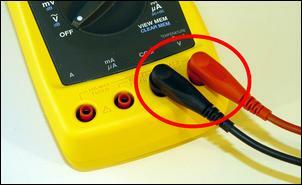 Alternatively, a cheap multimeter probe can be sharpened until it can easily be pushed straight through insulation. Be careful that you don’t slip, though.... After probing in this way you should wrap the break in insulation with electrical tape – this is especially important if the probing has been done under the bonnet. 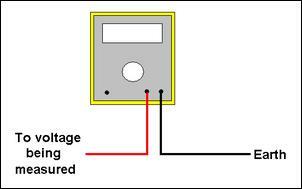 We’ve just covered how to electrically access the wiring, but when should you make measurements with the system plugged together and working, and when should you make measurements with the system apart? That’s a deceptively trickly question which depends largely on what you’re measuring. But here’s an example. Say you’re measuring the action of the factory boost control solenoid. You need to find out what frequency it has (ie how fast it turns on and off), its variation in duty cycle (ie the proportion of time that it’s open for when being pulsed) and its coil resistance (how much resistance it poses to the flow of a DC current). Both frequency and duty cycle measurements must be made with the solenoid plugged-in and working (so is easiest done by back-probing at its connector) while resistance must be measured with it unplugged (ie directly across its terminals). In addition, the frequency and duty cycle measurements must be made when the car is being driven. So much for the preliminaries - but how do you go about measuring volts, amps, ohms and all the rest? 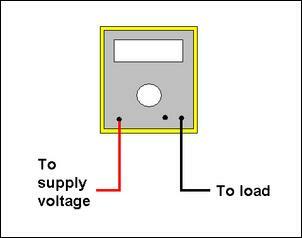 When measuring volts, the meter should be connected in parallel with the voltage source. In all car systems the voltage potential is with respect to earth – the car’s chassis. This means that normally you will earth the black lead (eg by using a crocodile clip to connect it to a clean bolt) and then use the positive probe to connect to the car’s wiring. 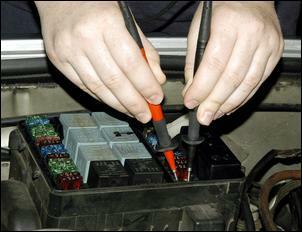 For example, say you're trying to find a 12 volt supply for an accessory, or measuring the voltage output of a sensor. In either of these cases, the meter would be set to its 20 volt (or 40 volt or autoranging DC volts scale, depending on the meter), the negative probe earthed and the positive meter probe inserted into the connected wiring. If the polarity is wrong (you've used the negative probe to the positive supply line) then no damage will be done - the meter will simply show negative volts instead of positive volts. 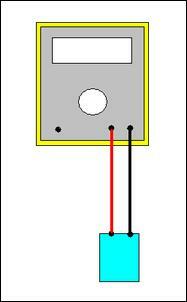 When measuring voltage the circuit does not need to be broken - the meter is inserted in parallel. 1. 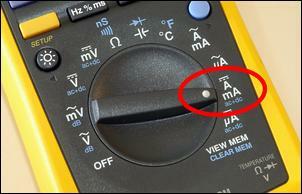 Set the multimeter to measure Volts DC. 2. Make sure that the leads are positioned to measure Volts. This is normally the default position. 3. 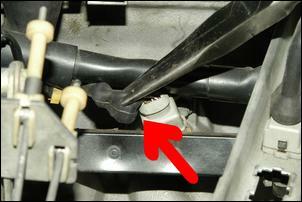 Carefully remove the boot covering the back of the airflow meter plug. 4. Connect the negative lead of the multimeter to the chassis (ie earth). 5. Back-prove the airflow meter plug terminals, one after the other in sequence. 6. Here 5.1 volts can be found on one plug terminal. That’s the regulated power supply to the meter. 7. And on this terminal a voltage that changes with engine load can be found. It’s 1.3V here but when the throttle is opened, it immediately rises. This is the airflow meter output signal. And why would you want to find the airflow meter output signal wire? You could be wiring in a fuel interceptor, installing a voltage switch that operates on engine load, or tuning the action of the airflow meter (see Real World Air/Fuel Ratio Tuning). Measuring current (amps) requires that the circuit be broken and the meter placed into it, so that all the current flows through the meter. 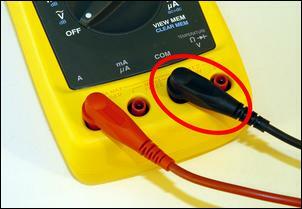 If you're measuring currents above milliamps, the meter will often require that the positive probe plug be inserted into another socket. Failure to do this will result at best in the blowing of an internal multimeter fuse, and at worst in damaging the meter. That means you always need to be very careful when measuring amps! 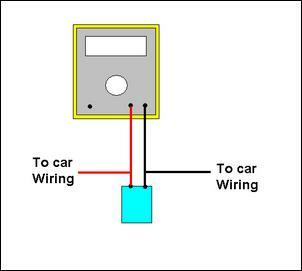 Breaking the circuit to measure current flow can sometimes most easily be done by removing a car fuse, and inserting the meter at that point. Obviously, though, if that circuit has a short circuit then the original fuse protection will be lost and the meter's fuse could be blown instead. 1. Set the multimeter to measure Amps DC. 2. Move the leads to the Amps measurement position. 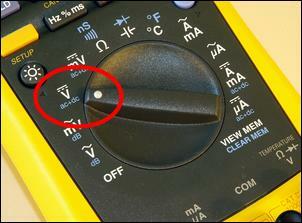 Normally, the negative lead (circled) stays in the same socket but the positive lead is moved. 3. 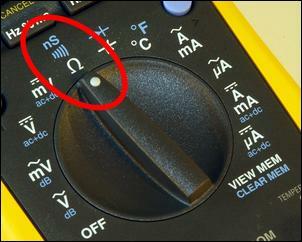 This Fluke multimeter clearly indicates on the display that the leads need to be altered if Amps measurement is selected but the leads aren’t shifted. 4. The fuse for the circuit being measured is pulled. 5. 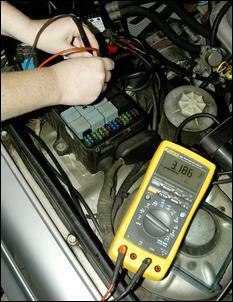 The multimeter probes are applied to either side of the fuse. 6. The current flow through the meter is then shown – here it’s 3.186 amps. And why would you want to measure current flow? If you’re installing a fan or pump you generally want to know how much current it draws so you can size the relay and fuse appropriately. 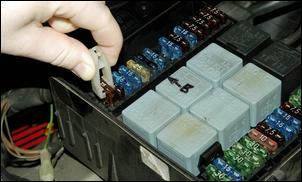 For example, a pump drawing 10 amps shouldn’t be switched with a 5-amp rated relay or have a 5-amp fuse. Resistance measurements require that the device is isolated from its normal circuit, otherwise the measurement could be false. 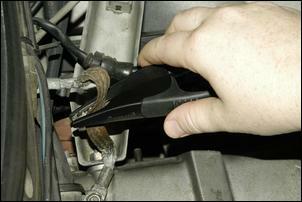 In the case of an engine management sensor (like throttle position) this means that it needs to be unplugged. If you try to measure resistance with the sensor still plugged into its circuit, the reading will usually be wrong! 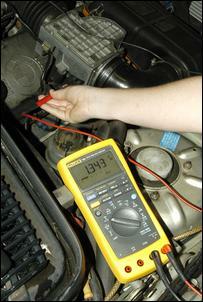 When a multimeter is set to its resistance function it passes a small current through the device being measured. This won't damage the device, but it does mean that the multimeter battery is being flattened more quickly. Don't measure resistances for a long period, or leave the meter set to this position. Always check that the multimeter indicates zero resistance when its leads are touched together - if the meter doesn't show zero resistance, what chance does it have of measuring a real resistance accurately? 1. Set the multimeter to measure resistance. 2. Make sure that the leads are positioned to measure Resistance. This is normally the default position. 3. Unplug the sensor, or as has been done here, remove it completely. Connect the probes one to each terminal and measure the resistance. Measuring sensor resistance is the most common way of fault-finding throttle position sensors and temperature sensors, including coolant, intake air and cylinder head sensors. The resistance values are compared with the workshop manual for different temps. Both duty cycle and pulse width should be measured with the meter paralleled with the device being measured, while the device is actually working. 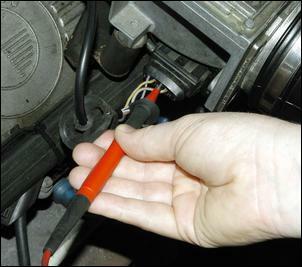 Injector operation should be measured in real operating conditions, with the best way of doing this being on the road with the multimeter located inside the cabin. With injectors, it is the max duty cycle which is often of greatest relevance, and the 'peak hold' button can be used to show this. 1. 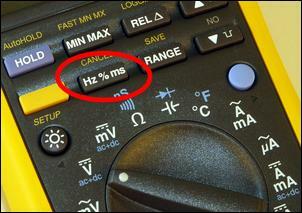 Set the multimeter to measure duty cycle. On many meters this requires that you first set the main dial to measure Volts DC, then press an additional button. On this meter, pressing this additional button takes the meter through a Frequency (Hz) – Duty Cycle (%) – Pulse Width (milliseconds) sequence. 2. 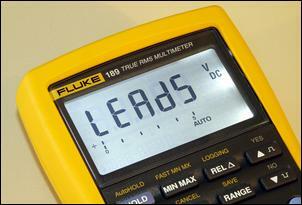 Make sure that the leads are positioned to measure Duty Cycle. This is normally the default position. 3. 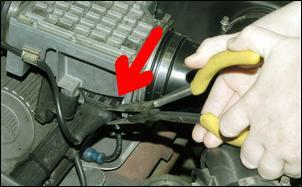 Carefully remove the boot covering the back of the injector plug. 4. Connect the probes, one to each conductor. 5. You may need to operate a switch on the multimeter that tells it whether it should regard fully low as 100 per cent or 0 per cent duty cycle. In the case of injectors at idle, they should be showing a low value like the 5 per cent seen here. 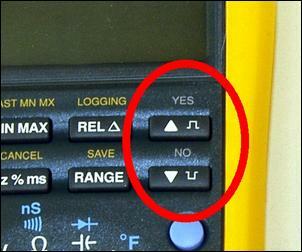 If they show 95 per cent at idle, press the button! Measuring injector duty cycle is most often done at high loads to see how close to flat out (100 per cent duty cycle) they are running. But measuring duty cycle (and frequency) can also be done to find which side of the injector is the switched side, which is useful when fitting some interceptors or triggering a device off engine speed. Temperature is most often measured using a bead or probe-type thermocouple. The bead unit has very little mass, and so reacts to temp changes quickly - but is fragile and hard to handle. The probe type has a slower reaction time but is easier to handle and more robust. Because of its speed of reaction, the bead type is more usually used. 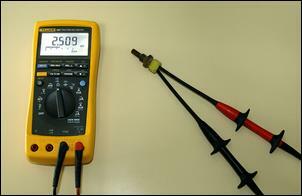 Using the thermocouple feature of a multimeter is as easy as selecting that function and plugging in the probe. Some meters also have an internal sensor, which allows measurement of the ambient temp of the day - useful when comparing different test day temps.